Part of our NEW Balmoral Range, this hand made 1pt glass tankard is designed with a star cut base. 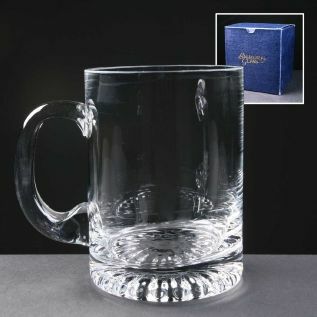 Ideal to present as a gift for birthday's, wedding, retirements and anniversaries, the tankard has plenty of space to incorproate your own special engraved message. Tankards are supplied complete with a 'Balmoral' designed protective box, however why not enhance your gift further by adding a satin lined presentation box, to view please click here. STEP 4 - Would you like a presentation box?